Convergent is the keyword for OpenBlade. 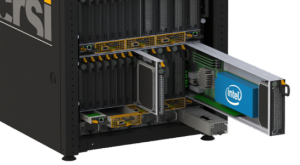 OpenBlade has been designed to reach a turnkey IT platform : network switch, management, redundant power suply and up to 16 dedicated blades in the same 5U rack. To go deeper in convergence, you can choose the blades you add. With blades dedicated to HPC, Broadcast, Big Data, or Rendering, you can build the solution that fits your need.